Chinese Democracy it ain’t, but it feels like the wait for a new Young Guns album has been pretty drawn-out. They’ve not exactly been twiddling their thumbs, though – as well as recording this, their third full-length album, they’ve been out having a crack at conquering the States, and, in what is a rarity for many British bands, they’ve been succeeding (having a song topping the Billboard Active Rock chart is nothing to be sniffed at). 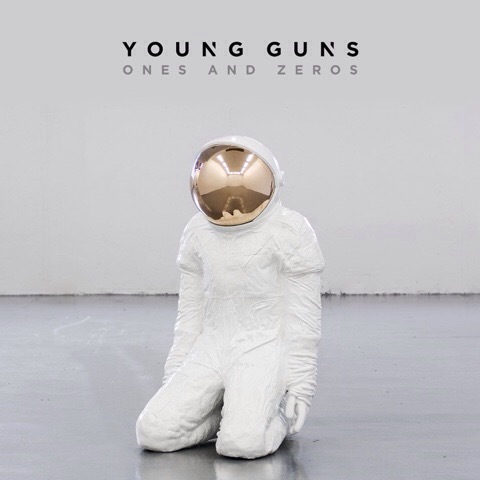 From the start, it’s been clear that Young Guns have sought more than just hometown glory and a reserved spot on the toilet circuit, and now, in the midst of the most fruitful period of their career to date, they’ve delivered Ones And Zeros, an album that mirrors the expanse of their visions. It sees them taking the same route as many of their friends and contemporaries have taken in recent times, moving away from the middle of the road and forging their own path. Theirs is now a sound built around sturdy electronics (ably overseen by U2 / Thrice producer Steve Osborne), and sees them deliver some of their most anthemic moments to date. The likes of I Want Out and Daylight are the kind of songs that will keep them in arenas when that moment inevitably arrives, while the slow-burning Lullaby and the billowing piano-ballad Die On Time show the perfect balance between a subtle post-punk influence and the roof-raising anthemia this band have so often made their weapon of choice. It may be the lightest Young Guns have ever sounded, but it’s a well-timed and forceful lunge at the mainstream. And therein lies the problem. The band’s debut All Our Kings Are Dead and, to an even greater extent, its follow-up Bones were both triumphs in terms of style and substance, but on Ones And Zeros, there’s an imbalance. Sure, the new electronic coating gives a shinier, glossier feel than previous, but there are instances where it feels poorly used, making for some of Young Guns’ first ever throwaway moments. Infinity – which would have been a great song anyway – is spoiled by overwrought, convoluted synths, while Gravity tries to emulate the crashing heft of opener Rising Up and ends up falling flat. The better songs far outnumber these missteps, but it’s difficult to ignore the detrimental effect they have as a whole. So has the wait for Ones And Zeros been worth it? For a large part, definitely, but the rest feels like a band in transition. To be fair though, at this moment in time Young Guns are a band in transition, and that they’ve managed to create an album like this, one with so many successes given their current status, is an achievement to be commended. There’s certainly room for improvement, but there are no doubts that they’ll easily be able to capitalise on what they’ve achieved here. If they carry on in this way, their next album has the potential to be a monster.